Electrical engineer Glenn Johnson has shared instructions on how to create a Kindle that is accessible to all, with his one-of-a-kind creation dubbed the Frankenkindle. Glenn's work sees Amazon's popular e-reader modified to work with the controls of a vtech V.Reader. The custom device was created with his sister in mind--she struggles to use modern electronics due to cerebral palsy, so big-brother Glenn set out to create a gadget that was easier for her to interact with. The result is a basic hybrid device controlled by easy-to-press large buttons, taken directly from the vtech machine. These chunky buttons are indirectly wired to the Kindle's IO, which when pressed activate certain functions on the book reader. The re-tooled functionality is possible thanks to the help of an attached Teensy++ board, which routes the inputs between the vtech buttons and the Kindle hardware. Although basic, this mod is endearing due to the way it brings technology to someone who would have otherwise found it difficult to use. Oh, and that wood finish is totally giving me a do-it-yourself Apple I vibe. 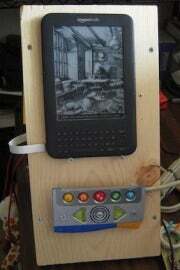 Glenn's work on the Frakenkindle took place last year, but now full instructions on how to create a similar device have been posted online via Design News [PDF], including the code required to make the e-reader magic happen.